Hello everyone and Merry Christmas (or other comparable holiday of your choice…)! Here in Sweden, we do the gift swapping on Christmas Eve with today being devoted to pigging out on leftovers and slouching in front of the TV. A perfect time to post a quick blog entry, in other words. 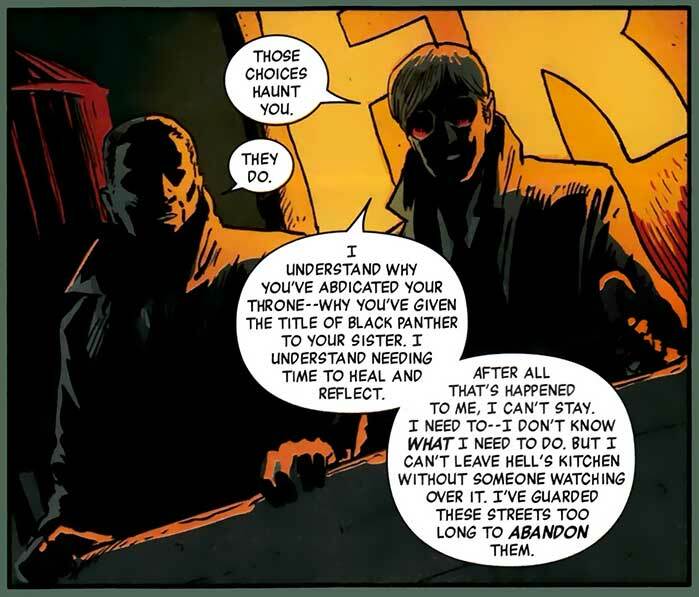 As you all know, Black Panther – The Man Without Fear #513 came out last week. Since I have tog give two months notice to drop a title from my in-store subscription (and I couldn’t be bothered to), I actually picked it up. Probably a good choice since it actually has scenes of Matt Murdock (and Foggy!) in it and i generally try to pick up comics in which Matt/Daredevil guest stars. Black Panther #513 (still feels weird to type that number when it really “belongs” to someone else) was actually a pretty good read, even though the justification for having the Black Panther (of all heroes) fill in for Daredevil feels forced. I like the new villain who comes across as more multi-faceted and menacing than most comic book villains out there, and the art is really quite nice. I probably won’t keep reading Black Panther though, since it 1) didn’t hook me to the extent that I absolutely have to know what comes next and 2) I don’t want to endorse this kind of bait and switch move on Marvel’s part. Did any of you guys read it and, if so, what did you think of it? One of the many things I like about running this blog is playing around with the technical aspects of it. I like to try out new looks and new functionality and am planning a little overhaul before 2011 rolls around, during which the site will be down for five-six hours. I won’t give away all the details, but I’d still like to take this opportunity to ask if there are any specific features you’d like to see. On that note, I wish you a very Merry Christmas and final week of 2010! I’ll check back in with you in the next few days. I actually really liked black panther #513, I thought it was surprisingly good. The new villain looks like a interesting character as well. I`m going to go with it for now and see how things develop. What`s your thoughts on the big upcoming marvel event of 2011, Fear itself. The only reason why I mention this is because I can see Daredevil making his comeback and maybe saving the marvel universe in the process, and in doing so redeeming himself and hopefully reclaiming the man without fear title. Fingers crossed. Either way I think Daredevil is going to feature in this story somehow. I’ve always thought the relationship between Matt and Panther was very interesting, I like BP, and it’s interesting that Matt gave him his sanction. I think I have the same issues as everyone else with the situation but the story looks good so far. I love T’Challa, but I am not buying the title on principle. Hopefully Reborn will give us all something to rave about, come January.